As MiFID II’s implementation looms, understanding its scope and potential aftermath has been and will continue to be an uphill climb. London, 14 December 2017 – Love it or loathe it, there is no way for financial institutions to ignore Markets in Financial Instruments Directive’s reinvigorated second lease on life. Having undergone a complicated and expansive makeover, MiFID II, coming into force on January 3, 2018, requires a great deal of attention and costs a whole lot more to implement than its predecessor did a decade ago. For private banks and wealth managers in particular, the new regulatory framework is difficult to navigate, the obstacles to profitability it poses are numerous, and the battle to comply and compete in a post-MiFID II world has only just begun. 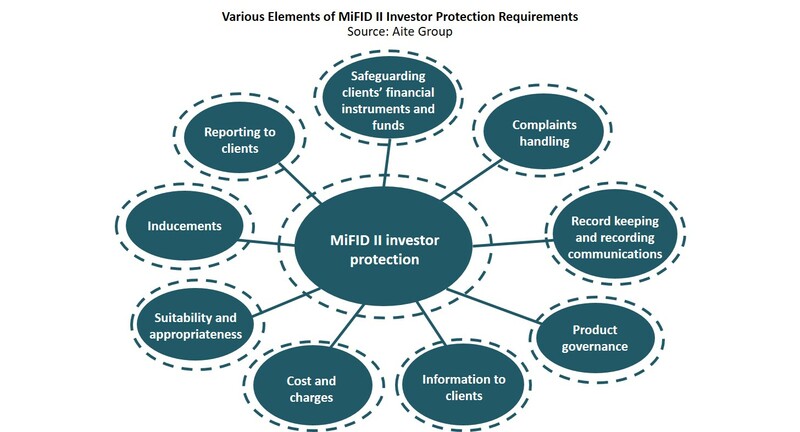 This report identifies the key implications of MiFID II for private banks and wealth managers, highlights industry participants’ shared concerns, assesses the current industry readiness and strategies being adopted to comply, and provides guidance that will be crucial to tackling the game changers and curve balls that are bound to come. It is based on 12 qualitative primary interviews conducted in September, October, and November 2017 with members of MiFID II project teams and senior management at private banks, wealth managers, consultants, and platform providers across Europe. This 34-page Impact Note contains two figures and five tables. Clients of Aite Group’s Wealth Management service can download this report, the corresponding charts, and the Executive Impact Deck. This report mentions BNP Paribas, Carmignac, Charles Stanley, Citi Private Bank, Credit Suisse, Deutsche Asset Management, Deutsche Bank Wealth Management, Fidelity International, HSBC Private Banking, Lyxor, Microsoft, Société Generale Private Banking, and UBS.